Are you seeking details for best retirement mutual funds in India 2019? Then I must say, you are placed in the right place. In this post, I have shared best knowledge regarding best retirement mutual funds in 2019! Every other person on this earth wants to see his/her future safe and secured and to plant the dream of this secured future into the real canvas, he moves towards the all-around retirement plans. A retirement plan is a well-thought-out plan which is built by an individual keeping in mind the long-term goals of life. The planning is done when the individual is in his earning stage in order to fulfill his and his family financial needs even after his retirement. The motive is just to make themselves independent and self-secure. There are many retirement plans these days coming in the market, like the Life Insurance plans, but beyond this, there is one more tool in the market, which meets the every expected need of the retiring individual and which is called as the ‘Retirement Mutual Fund plans’. Let us see that how should you invest in mutual funds for retirement income? and how can you get benefits out of it? This is the duration of accumulating your wealth little by little and spreading that wealth at wise- destinations keeping in mind your risk profile and the time horizon towards the retirement. You can choose any investment option such as Fixed deposits, debt funds, equity funds or mixed-funds, gold investments or the real-estate. You should follow the ideology of your age base and accordingly you should design your portfolio for the retirement. A person generally works for 30 years to save his other upcoming 30 years. So, if your age is 30 years then subtract it with 100. 70 is the obvious output. You should invest your 70% wealth in equity based-securities while the 30% should be kept with debt funds. It is because you will gain regular and safe returns with debt funds and on the other side, you can enjoy higher returns with equity sometimes. In this way, you should accumulate your wealth and keep them investing in the best mutual funds for retirement portfolio in India. This stage comes after when the person gets retired from his job. The preservation and distribution principal says that all the accumulated wealth should be preserved and optimized in the best way so that its wastage can be secured and usage can be used optimally for a long term. The retired person should make short-term plans to grow his wealth little-by-little and maintain stability in his lifestyle. The person can invest in short-term debt funds whose maturity period arrives in 6-12 months. In this, the person can gain 7-8% as returns. Or he can plan for Systematic withdrawals where he can ask his MF houses to pay some fixed amount by selling out the units available to them. Unlike other insurance plans or Fixed Deposits, the retirement mutual funds do not demand filling premiums on time, neither it builds the restrictions on withdrawals of money from the account. The person can withdraw money, partially or completely, without any exit load restrictions. This is not true when it is subjected to other insurance plans, other than the Mutual Funds. The Retirement income from mutual funds is tax efficient than the other insurance plans because it saves your 10% tax on interests after indexation. The other plans charge mostly 30% on your returns thus leaving only 70% income for you out of 100%. Moreover, taxes on retirement investment mutual funds are levied only when they are sold in the market while it is levied monthly or yearly in other insurance plans. The person can select his choice mutual funds for retirement investing because the details regarding the retirement plan, its fund manager, AMC, strategies, past returns, the risk associated etc., everything is available publically via the internet which is often not possible in other pension plans. Well! If you want to invest your money for retirement purpose then Mutual Funds for Retirement Planning is the best option. There are some best Mutual Fund houses, where you can optimize your money in the best way. They are categorized according to the investor’s age at which age they are investing money for the retirement purpose. 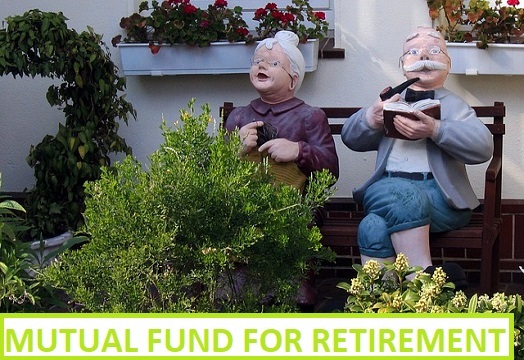 Some examples of Mutual Funds for Retirement corpus. Let’s take into consideration every age-group one-by-one. After observing the above tables, you’d surely be able to decide that which plan you would want to choose for your Retirement planning through mutual funds. All the above plans are well-established and come in the category of good plans. You can yourself check the outputs generated by each fund plan and accordingly check your age and various other factors to select the plan which suits you the most. How is share income tax calculated? Dear readers, Thanks for reading! Your future is created what you do today not tomorrow! If there is anything left which I may consider to help you, then, please tell me. You can use the comment box to share your experiences, your knowledge, and even your doubts. I hope you are satisfied with the above study on retirement mutual funds in 2019. Please like and subscribe to this site if this article helped you in some way. Your suggestions are always welcomed here. Eager to post another article.